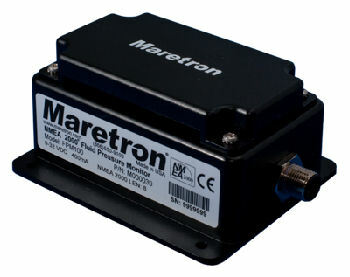 Maretron?s Fluid Pressure Monitor is used to adapt up to six pressure transducers to the NMEA 2000® network (pressure transducers sold separately). This allows you to observe fluid pressures and tank levels anywhere on the vessel where there are NMEA 2000® compatible displays. With the appropriate transducer, the FPM100 reports either pressure or vacuum for a variety of applications including water pressures, oil pressures, hydraulic pressures, or system vacuum for detecting clogged filters.